Looking at all these great images taken from remote robotic telescopes that grace our website and you might be thinking: these are certainly nice to look at, but how can I learn for myself where these objects are located in the night sky? Maybe you just want to learn the patterns of the constellations, or desire a more in-depth understanding of celestial mechanics? Well for adults and kids alike I would go no further for a first astronomy book than H.A. Rey's "The Stars, A New Way to See Them". I myself read this as a young astronomy enthusiast in my pre-teen years and I recall how much I enjoyed reading it. Don't be fooled by your initial impressions if you check it out on Amazon: although lacking any photographs and possessing whimsical drawings by the same creator of Curious George, it is exactly these qualities that I find endearing and inspiring about the book. Highly recommended! I completely agree with Muir's recommendation. 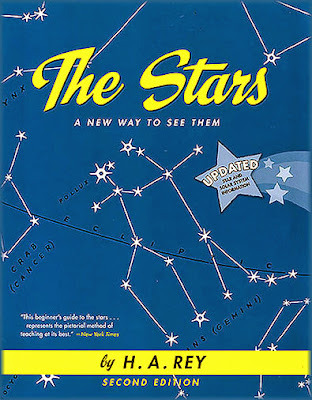 I learned most of the major constellations growing up from this book. H.A. Rey's depictions are amazing. Another good beginner guide to stargazing is H.A. Rey's, "Find the Constellations".